1. Cubed pork into 2 cm x 2 cm cubes, mix with all ingredients listed under for marination and marinates the pork for at least 20 minutes. 2. In a cooking pot, add 1 tsp oil and stir in shallot and garlic, stir until fragrant, then add the pork pieces, fried until browned. Add 3 cups of water and add soy sauce and sugar/dark soy sauce, cover with lid and bring to boil at high for 5 minutes, turn to medium and continue cooking for another 45 minutes or until pork become tender. 3. Meanwhile shell, devein the shrimps and cut into 2 cm in length. Mix 1 tbsp of corn starch with 3 tbsp of water, set aside. 4. 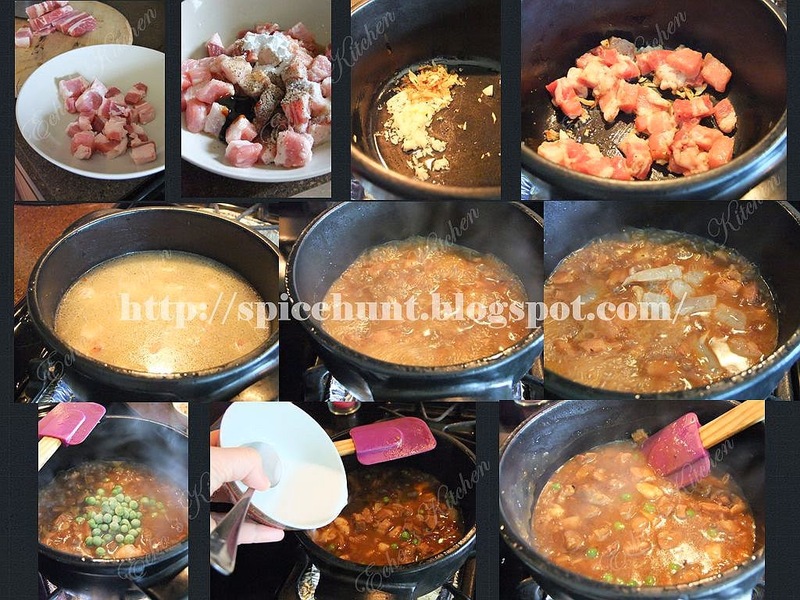 When the pork become tender and the water reduced to half, bring the heat up to rolling boil, add the shrimp and quickly followed by frozen peas, when the shrimp changes color, quickly stir in the corn starch. Once the gravy thickened, It is done. 5. 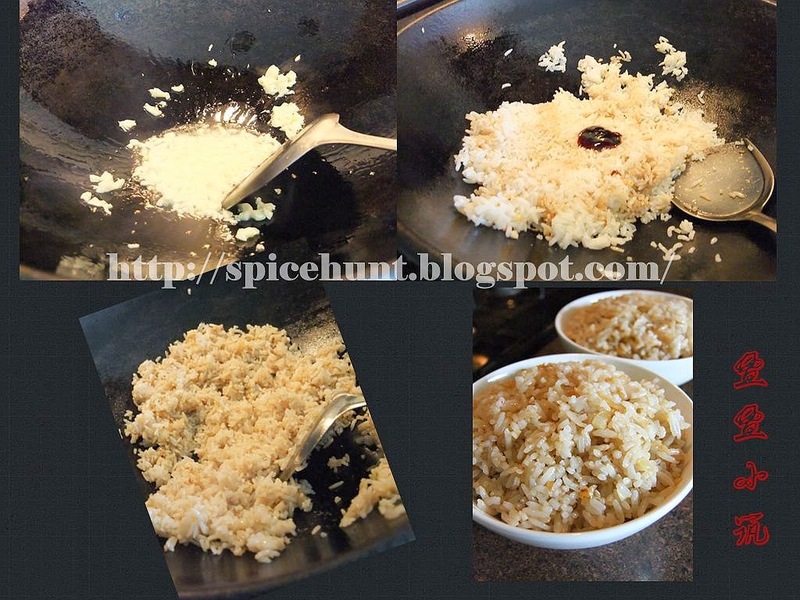 When the pork was simmering away, prepare garlic fried rice, in a heated wok, add 2 tbsp of oil, stir in minced garlic and stir until fragrant, add the cooled rice and break the rice with a spatula, keep stirring at high heat until rice loosen. 6. Season with soy sauce and oyster sauce, continue stirring until the rice is fluffy and well done, add a few drops of sesame oil before switching off the stove. Note: It is important not to over season the rice, as you don't want the taste of rice over powered the stew, over season may make this dish too salty also. 7. To serve the rice, simply place fried rice in a 3-4 bowls and portion pork and shrimp stew equally on the rice. You can steam this dish on a steamer for 10 minutes to mimic the effect of a steamed dish like what they do in dimsum express. I personally think it taste just fine without steaming. Hi Shirley! Welcome! Just visited your blog.. Woww you are a runner! This dish is surprisingly yummy! Whoever created it definitely know his costumer! nice.. it looks a little like the taiwanese lu rou fan! indeed! and taste very nice too! thank you so much!! Welcome to my blog! Hi, I found your blog by chance. I tried the recipe and it is very good. 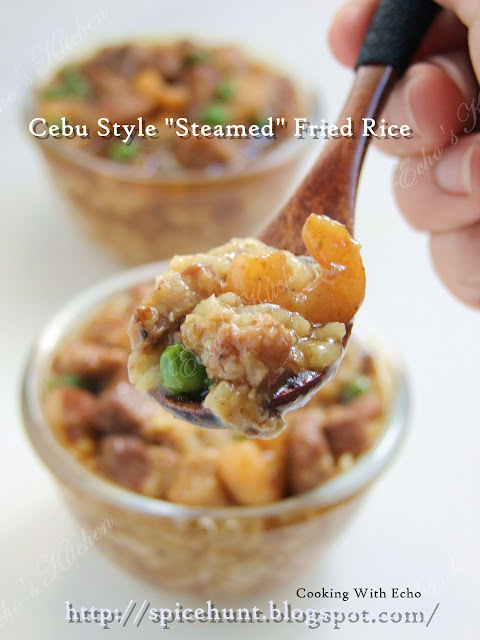 It is very good but not the same to the Philippine version of pork steam rice. I made some minor adjustments to make it closer. If you have the peeled shrimp head and skin, use it to make the broth for the pork stew. Also, I removed the garlic from the rice as it was overpowering the taste. Looking forward to try your other recipes. Hi Aco, Thanks for visiting my blog!And thanks for your feedback! I look forward to go and try the real thing in Cebu in the future!